Baker-Whiteley Towing Co., Baltimore, MD - blue flag, in center white disk; in top hoist and fly and in bottom white "BWT". Blue with a white disk, and thereon a blue star fimbriated red with a white "B" in the center. Created by a group of Baltimore investors as a result of the 1928 Merchant Marine Act to provide fast cargo service to Hamburg, Le Havre, London, and Southampton. Another unsuccessful attempt by an east coast city to set up a line expressly to divert cargo away from New York, although the lack of success was more a result of government action (cancellation of all mail contracts under the 1936 Merchant Marine Act) rather than through any fault of the line's management. The flag was a variation on the Maryland state flag, white with a cross bottony per cross golden orange and black. Baltimore Mail Steamship Co. Talbot-Booth in 1937 and 1938 shows a slightly different version with the cross being within the field and coloured red and black. An old company dating back, I believe, to the 19th century. Flag was red with white B. Sources: National Geographic (1934) US Navy's 1961 H.O. My interpretation of the originating logo on the company website is that it represents the normal Wilh. Wilhelmsen ASA flag i.e. white with a blue "W", with the apparent border being merely a means of highlighting the flag edges, as is continued to be done with the flag pole and hence the lighter shade of blue compared to that of the letter. The company states that it has operated independently since 1975 but Lloyds still show it as being part of the Wilhelmsen group. Although it appears that they originated (guesswork here) from Barber Steamship Line Inc. they are now with a registered head office in Hong Kong, an operating head office in Kuala Lumpur, and subsidiaries worldwide and so not exactly an American company. Again, not much but the flag, a fairly attractive swallowtail of blue and white stripes with a white disk bearing a red star and a white B. Originated 1902 as Barber & Co. Inc. operating the New York & Oriental Steamship Co. with sources initially showing the central white circular section being outlined black. From the 1930s they are shown as operators of American West African Line. Talbot-Booth in 1944 advises that the flag was sometimes a swallow-tailed pennant whilst Loughran (1979) shows a normal rectangular flag but also states that in 1970 there was a change to a swallowtail divided vertically orange and white with the orange further divided by a narrow white vertical band. They do not appear to have been ship-owners as such as I cannot locate them in Lloyds but Loughran indicates they were still operating in the 1970s, possibly as charterers or possibly as agents as it is under this latter description that it is reported in 1989 that they had been renamed Wilhelmsen Lines (USA) Inc. and it would seem that that at some stage they were acquired by Wilh. Wilhelmsen and were probably the beginning of what is now Barber International. 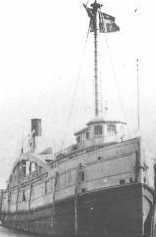 A short-lived Great Lakes shipping company was operated by the Barry brothers from 1900 on. Named the Barry Brothers Transportation Co., it was also known as the Barry Brothers Boat Line. Peter and Thomas Barry started out with a small ship but quickly replaced it, then bought two fine steamers from the Northern Navigation Co. of Cleveland and had them overhauled at great cost. The firm operated a route between Muskegon, Mich. and Chicago but was ambitious enough to contemplate linking Detroit and Cleveland, monopolized at the time by the Detroit & Cleveland Navigation Co. It was not to be. In 1901, the �State of Michigan� sank but there is also the anecdote of the �Empire State� being caught in the ice for a week while the passengers remained cheerful and had a good time (1902). Later this ship caught fire when moored (1906) and this may have hastened the demise of the company but I�ve been unable to find out when this happened. A card recently offered on eBay (Item no. 6591171240) shows the �Badger State� at Duluth and offers a partial view of the house flag (see this image). At any rate it had a dark colour, was traversed by a light-coloured cross throughout and apparently had the company�s light-coloured initials in the corners. Hopefully, a clearer picture will emerge some day. No information on the company. The flag, quarterly red, white, yellow, and blue, is from Flaggenbuch 1905. This may not be a US company, as Manning does not give home ports. Not terribly interesting in any case--the initials L.B. in white on a red burgee. Likewise, only the flag--white with a red border and the black initials of the firm. "Several insignia date back more than a century. Many are made up of common geometric shapes in combination with colored bands and initial letters while a few use corporate logos or other unique symbols. One might expect to see an initial "B" on Bethlehem Steel's insignia, pictured at left. Instead, one of the firm's products, an I-beam, is symbolized." A further link explains that an I-beam is �a rolled iron or steel joist (beam like those used in house construction) having an "I" section, with short flanges�. See, for instance, the lower corners of this company sharee (picture is clickable). The house flag is seen flying on this (clickable) picture: http://www.boatnerd.com/news/newpictures03/FLAGSbh3-27-03-al.jpg. It is yellow and bordered by narrow black-white stripes (upper horizontal edge) and white-black stripes (lower horizontal edge) respectively; in the centre is a shield-shape, narrowly outlined in black, containing a red I-beam. A vertically divided swallowtail, blue and red, with a white "H" on the center. No idea why "H."
I think George E. Billings was not the name of a shipping line, but the name of a ship - possibly the flag represented the Hall Brothers company of Washington state, who built it and who apparently also operated a fleet. According to www.merchantfleets.com/ShipPix/ShipPixG.html and pc-78-120.udac.se:8001/WWW/Nautica/Ships/Schooners/Schooners(5m).html the George E. Billings was a five-masted schooner built by the Hall Brothers shipbuilding company of Puget Sound in 1903 and was named for the manager of the Hall Bros. fleet. The flag, as shown by Lloyds 1912, is actually tapered. George E. Billings was the name of a ship. In my capacity as Project Archivist, I have encountered a photograph of a ship bearing the name of George E. Billings tied to the pier (locally referred to as The Embacadero). Yellow flag charged with a device made of a wheel, two oars and "1880". The flag for E.N. Bisso & son, Inc. has a ship wheel with two red boat paddles. We are a tugboat company.